I just got his newest album a couple of weeks ago, it's not bad. That song "Closer" is pretty popular these days I think. Anyway, Ne-Yo is going to be in Boston hosting an afterparty at Rumor this upcoming Monday. Neyo hosts the afterparty for Monster Jam at Rumor with Nina Sky, Yung Berg, Brandy and more. 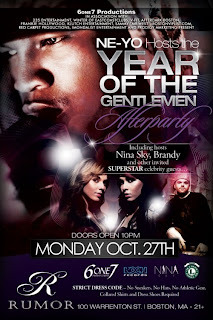 0 Response to "Ne-Yo at Rumor this Monday - 10/27"